The London art market is a beast with two heads. One of those heads is ugly. How ugly was brought home to me recently when I found myself researching the so-called “cleaning” of the Elgin Marbles that took place at the British Museum in the 1930s. This cleaning — it was actually more of a skinning, and should, in my opinion, have resulted in the immediate return of the marbles to Greece for safekeeping — was arranged and financed by an unscrupulous art dealer called Joseph Duveen. Did I say unscrupulous? Make that satanic. Having cheated, stolen, deceived and sweet-talked his way to extreme riches by misselling Renaissance masterpieces, Duveen spent his later years bleaching his reputation by bankrolling Britain’s museums. The space in which the skinned Elgin Marbles are displayed today is still called the Duveen Gallery, after its terrible builder. Over at Tate Britain, the entire central galleries bear his name as well. This satanic entanglement between the dealing world and our national collections, the art market’s ugly head, is balanced by the sweet visage staring across at it: the other noggin. Were it not for the art market, our national collections would be a shadow of their glorious selves. The art market is the tap that tops them up. In recent years, for example, I have had the enormous pleasure of being able to pop into Philip Mould’s fine gallery in Mayfair, where I have feasted my eyes on Van Dyck’s last self-portrait, painted in 1641. I must have seen it six or seven times. On each occasion, the joy of being able to examine this great painting at my leisure, free, made me thank God for Mould’s wallet. Suave, handsome, eloquent, witty, Mould pops up regularly on the Antiques Roadshow as one of the resident art experts. As a specialist in 17th-century English portraiture, he is a man after my own heart. You may also have seen him on Fake or Fortune?, in which he scours the world searching for overlooked masterpieces with his unlikely sidekick, the newsreader Fiona Bruce. The Van Dyck was hanging in his gallery because, in 2009, Mould, in partnership with an anonymous American investor, had acquired it at Sotheby’s for £8.3m. Earlier that same year, the portrait had appeared in a popular show at the Tate called Van Dyck and Britain. So it was already well known. Not surprisingly, the National Portrait Gallery was rumoured to be interested in it. As Van Dyck’s last self-portrait, painted in the year of his death — which happened to be the year before the outbreak of the English Civil War — it was a picture of exceptional national significance. I certainly wasn’t alone, therefore, in regretting the failure of the National Portrait Gallery to acquire it in 2009. Yes, £8.3m was a shocking amount of money, the most paid until then for a Van Dyck, but this was a special picture. At least it had found a temporary home in Mould’s gallery, and, before it was shipped off to America, anyone who was interested could pop along and see it. One year grew into two; two into three. And, amazingly, it was still there. Now, suddenly, we hear the government has finally slapped an export ban on it; that it has become the subject of one of those disingenuous Save the Picture for the Nation campaigns; and that attached to it today is the huge new price tag of £12.5m. Buying it today will cost the nation £4m more than buying it in 2009. The newspapers are also reporting that its prospective new owner, in America, is James Stunt, the world’s leading collector of Peter Lely paintings. Why Stunt has chosen to go for the Van Dyck now, when it has been hanging in Mould’s gallery for three years, I do not know. But the timing has forced the NPG and the government into action. Had we still been living in the world of Duveen, all this would perhaps have prompted the raising of an eyebrow. In Duveen’s world, the art market and the national collections would have been in cahoots; the picture would have been parked somewhere deliberately until funds became available; and Stunt would have been named only to raise the asking price. Thankfully, those days are over. Stunt certainly exists — he was the lead sponsor of the Lely exhibition at the Courtauld last year — and there is no reason to doubt the NPG when it explains that a combination of circumstances made it impossible to buy the Van Dyck in 2009. It’s a marvellous picture. So I’ll certainly be putting my money in the box. But the annoying fact remains, instead of the £8 I could have put in in 2009, I now have to put in £12. Something isn’t working. Nor does the story end there. 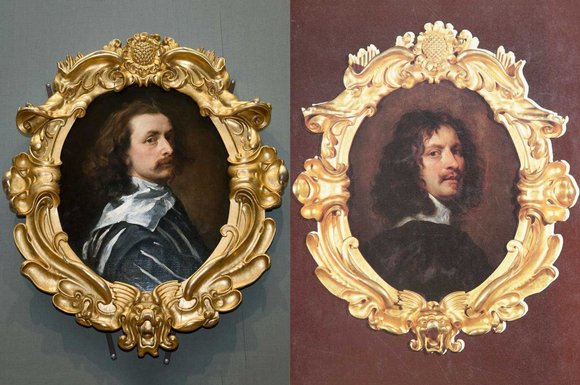 When the Van Dyck went on show at Tate Britain in 2009 — just before the Sotheby’s auction in which it was sold — hanging next to it was another crucial picture in the story of British art: another self-portrait, cased in an identical frame, showing another artistic hero of the times: the English painter William Dobson. Both were owned by the Earl of Jersey. And, sure as eggs is eggs, both ought most certainly to be in the national collection. Regular readers of this column will know already that my admiration for Dobson knows few bounds. After Van Dyck’s abrupt death in 1641, it was Dobson who succeeded him as the king’s official painter — just in time for the outbreak of the Civil War. So the fates dropped him right in it. My, how he rose to the challenge. A hundred years before the coming of Hogarth, England had spawned a native artist of genius. With Dobson’s known career lasting only four fateful years — he died in 1646, at 35 — his pictures are particularly rare. (Even finding an image of his self-portrait for these pages was a treasure-hunt: the one here is from the cover of a 1984 catalogue for a Dobson show at the NPG.) Seeing his self-portrait in 2009, paired with the Van Dyck, raised the thrilling hope that one day the two could be reunited where they belong: in the National Portrait Gallery. I thereby call on the Earl of Jersey to donate his Dobson to the nation as an act of historical generosity; failing that, to sell it to us soon at a reasonably low price. In the hope of that happy circumstance arising, I hereby pledge £1,000 of my own cash to any national attempt to secure the Dobson self-portrait.